Political selfies with candidates have almost become the new yard sign in presidential politics. 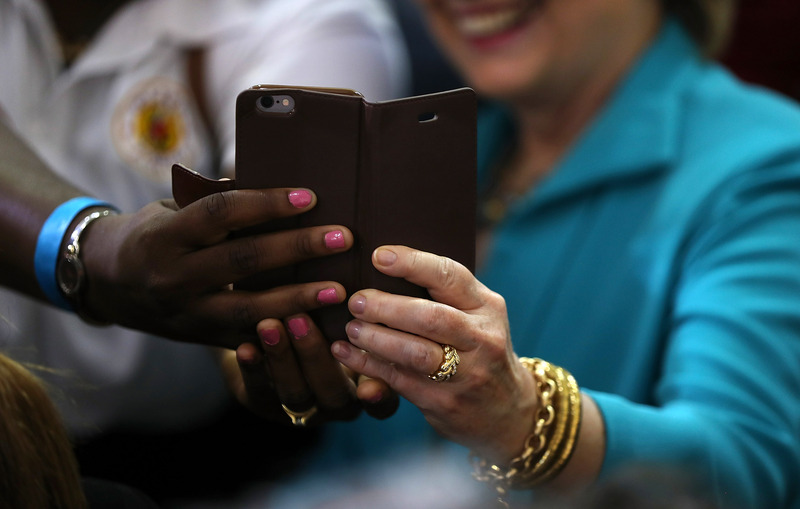 Instead of holding babies, Clinton and Trump held up supporters' smart phones, smiling into the front-facing camera. The phenomenon didn't start this election season, but it is surely more ubiquitous in 2016 than even in 2012, when President Obama set the norm for using social media in campaigns. But selfies permeate more than just the campaign. World leaders take them together and members of political parties, as well as representatives in Congress aren't left out either. Without a handful of memorable political selfies, 2016 just wouldn't have been the same. Those out on the campaign trail could arguably make up the majority of all political selfies taken this year, but that's not all we're going to focus on (you're welcome, Ted Cruz). Those moments came and went — as did the legion of former Republican candidates for the nomination. And though these photos capture singular moments from 2016 that America may very well forget in the years to come, it's kind of crazy to think that a smartphone held up in one's face has become such a giant trend. There's of course more to analyze about the year, the 2016 campaign, and the state of the world going forward, but you might as well start with the selfies. These two are known to get along quite well. This shot was posted when they met in Mexico for the North American Leaders Summit. Twitter made plenty of jokes about Mexican President Enrique Peña Nieto being left out, but there's just something special between these two. Sadly for Canadian Prime Minister Justin Trudeau, president-elect Donald Trump will likely not be as handsome of a social media bud. Paul Ryan's selfie with Capitol Hill interns reminded America that it has a long way to go when it comes to promoting diversity in government. This sparked the Twitter hashtag #InternsSoWhite and garnered Ryan more than his normal share of Instagram comments. It's important to note that it wasn't just the GOP's interns in the photo. Interns from both parties were included in the photo. You may have one of these on your iPhone: a picture with Clinton, Trump, or one of your preferred primary candidates. They're the new standard, and you'll want to get yours in 2020. And of course, even celebrities are getting their selfie. Take this one from Kim Kardashian that she posted with Clinton and her husband Kanye West in the background. Even Clinton was impressed, later telling Ellen that she had never looked better. Millennial discontent was a constant headline this election season, but the group clearly went for Clinton at the polls. This massive selfie moment could have been the beginning of some really great selfies. While we have been focused largely on the unending presidential campaign, the rest of the world has carried on addressing real issues. In Germany, the government has been working on integrating the huge number of migrants that have fled war and economic oppression. One Syrian refugee took a selfie with German leader Angela Merkel at a center in Berlin. After the photo was posted, trolls began falsely accusing him of being a Brussels bombing terrorist. He was not associated with the attack — nor any others — in any way. He told the Deutsche Welle that he was "saddened" by the false accusations. And the repulsive urge to associate "Syrian refugee" with "terrorist" is representative of the Islamophobic sentiment present in the international community. Once more the GOP thought it would be good to capture how unrepresentative of America their elected officials are. VP-elect Mike Pence took the photo himself. I feel like you need to see it with the selfie-stick visible for full effect. Since the election, much of the political news has focused on Trump's cabinet picks. He's met with lots of his GOP supporters, and this selfie with Florida Gov. Rick Scott exemplifies the many meetings he has had in Trump Tower and at his New Jersey golf course while trying to narrow down his picks. The early Trump backers in theory were going to be rewarded, and so Scott headed in for meetings and selfies. Thus far he, former NYC Mayor Rudy Giuliani, and New Jersey Gov. Chris Christie have all been passed over. Some of those famous Clinton sightings in the woods have been captured with selfies. And Bill has been there for at least a couple. And while Clinton surely appreciates the kind words from supporters who run into her, it's important to remember she's probably out in nature for some alone time. Perhaps the selfies in 2017 will be just as riveting, but it's more likely to be presidential Twitter rants that take the cake next year. We've seen plenty of examples since Election Day already. So thank you 2016, for a very interesting year — selfies included.